Book 10 nights July 8th to 18th for £3521 plus25% off available May dates. Luxurious spacious villa in a traditional style within walking distance to the centre of Carvoeiro. Stylish comfortable interior, extremely well equipped modern kitchen with American style fridge freezer, range cooker, granite worktops and breakfast room. Utility room with large bottle cooler. Separate dining room with steps down to rear garden with tiled table and built in seating. Large open-plan living room with French windows leading to terraces and large salt water pool with water slide, BBQ area, bar/games room and covered seating area for 12. Master bedroom on first floor with walk-in wardrobe and large bathroom with jacuzzi corner bath and separate shower.Two further bedrooms with en suite facilities, and 3 more bedrooms sharing 2 bathrooms.Self-contained apartment with separate living room, kitchen and terrace overlooking the pool. Facilities include Wifi, LED TV, Apple TV, Satellite TV, CD, dishwasher, washing machine, microwave. Air-con in bedrooms, central heating, 2 folding beds and cot at extra cost. The villa is situated in a quiet residential area of Carvoeiro but only a short walk to the centre with its bars, restaurants and shops, and the beach. 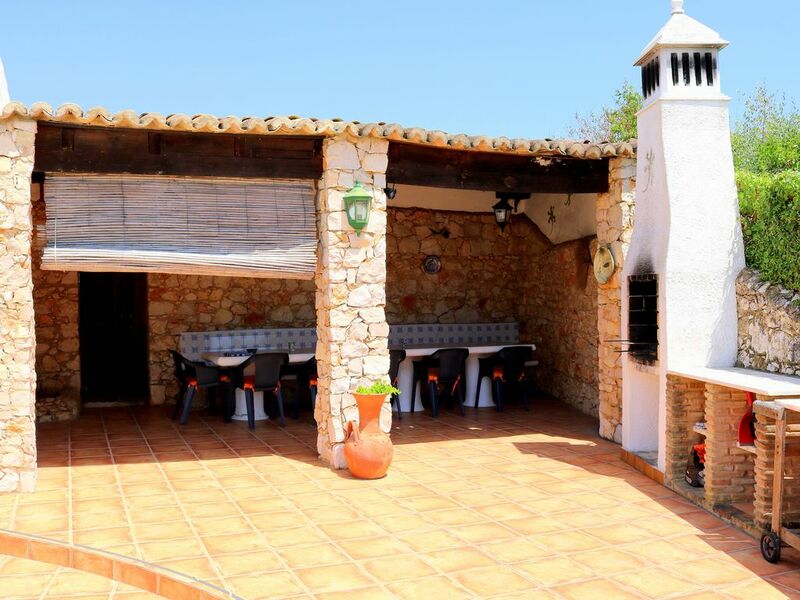 There is a bar, restaurant and mini market very close to the villa as well as the main fruit/veg/fish/meat market. A short drive away are several beaches, two excellent 18 hole golf courses at Gramacho and Pinta (as well as the nearby 9 hole par 3 course at Vale do Milho), Carvoeiro Clube de Tenis and the tennis club at Rocha Brava. Slide and Splash water park is a 10 minute drive, and Zoomarine (aqua shows and swimming with dolphins), Algoz zoo, Pera sand sculptures and Aqualand water park are all within 20 minutes drive. A large supermarket, Intermarche, is on the outskirts of Carvoeiro. Tourist Licence AL 7093/AL. In all bedrooms (at extra cost). Maid service 3 times per week. Strictly no smoking inside the villa please. ,shops,bars and restaurants and a nice little mini market across the road. Would definitely recommend. Huge villa with everything you need close by! I’ve stayed at the villa for one week with my big family of 13! (9 adults, 4 children) We have all been very pleased with the stay, and would love to come back. The villa is huge, with great common areas. The kitchen is big, and well equipped even though a few things should be replaced for something more modern - like better kitchen knifes. + big pool, much space, close to minimarket, Good restaurants, close to beach, smart-tv. - slow wi-fi, not enough hot water for 13 people. This visit to this wonderful villa, and although in the quieter months the house and Carvoeiro still don't fail to impress. Huge spacious house, more than enough for a large family and friends. 5 minute walk into Carvoeiro which has all amenities but also ideal suited for a hire car as its situated centrally in the algarve. The house is always immaculate and Truus the villa manager is always a phone call away to help with any queries we have. Amazing pool and outside facilities, perfect for BBQ and relaxing. Will be coming back in July for another visit. Couldn't recommend a villa highly enough. A huge property with plenty of space for 9 adults and teenagers,. Fab outside spaces.,Pool area and bar/games room and outside dining were wonderful. However if wi fi, TV and air con are a priority to you this may not be the place for you. No wi fi unless you purchase a dongle - however 2 mins down the road the kids found free wi fi spot to give them an Internet fix! TV doesn't really work. Which didn't matter to us . Air con tripped the electricity constantly if it was on in more than one room. Thanks for the feedback. We now have broadband in the villa so wifi is freely available for guests. The television has been replaced and we now also have Apple TV. Enjoyed another lovely holiday in this beautiful villa - it has everything to make your holiday one to remember and is a short walk from the town. We have been several times to this villa and would not stay anywhere else. Couldn't recommend highly enough. A large villa in an ideal situation 5 minutes walk to the town. Villa Manager very helpful. Kept clean and tidy (cleaner comes almost every day). Beach towels supplied which was helpful. Great BBQ and outdoor dining area. Pool room/ table good, but table top table tennis needs replacing. Lovely pool with slide, but pool tiles missing and needs repairing. Water in pool needs constant filling. Dining furniture rickety (promised to fix). If all aircon on at same time, the electrics trip and you need to go and reset all the time at the fuse box. Old big box TV's! No WIFI which is strange in this day and age, only a dongle! For this money you would expect more modern equipment. Wardrobe door just fell off without even touching it (they fixed this immediately though), shower head needing fixing (again done quickly). Overall, the position is ideal being a short walk to town and the restaurants and bars. The outdoor area is good, but it in general everything needs a bit of renovation. Also beware that items got deducted from the deposit even though the issues were nothing to do with us! Not much but enough to be very frustrating/annoying. Modern? No, more traditional old style villa, but needs renovation. Would I recommend it? Not sure, depends on your expectation for the money. I guess you could get more modern accomodation with better facilities outside of town for similar or better pricing, but you have to balance that with the ease to go out in the evening and have shops an amenities on your doorstep. Carvoeiro has plent yof choice for restaurants, bars etc. It is iease to get to all the Algarve atttractions. Plenty of golf course within 30 mins drive. Thanks for your feedback. All of the issues mentioned are being addressed. The villa is situated a short walk from the centre of Carvoeiro, a delightful fishing village nestling around a beautiful bay with its golden sandy beach. Water sports available in summer months. There is also a diving school at Paraiso, a 5 minute drive away. Carvoeiro offers a wide choice of restaurants, shops and bars. Nearby towns are Portimao and Albufeira and Guia with its state of the art shopping centre. There are waterslide parks nearby at Lagoa and Porches. Golf courses are plentiful in the area, 3 of which are 5 minutes drive from the villa. The historic town of Silves is a short drive away. The beautiful beaches of Centianes, Paraiso and Alfanzina are all within walking distance. Golf: The Algarve has long been a magnet for discerning golfers with its spectacular scenery and fabulous coastline. The golfing season runs from late Autumn to late Spring and you can enjoy warm sunny days in the Algarve's mild winter. There are 29 beautiful courses on the Algarve, and 9 of them are within a 15 minute drive from Casa Sacada: the Penina Resort course, Penina Championship course, Morgado, Alamos, Alto Golf, Pestana Pinta, Pestana Gramacho, Vale do Milho and Salgados.